Robin’s Nest Centerpiece Bread | I Wanna Bake! Happy belated Easter! In true I Wanna Bake! 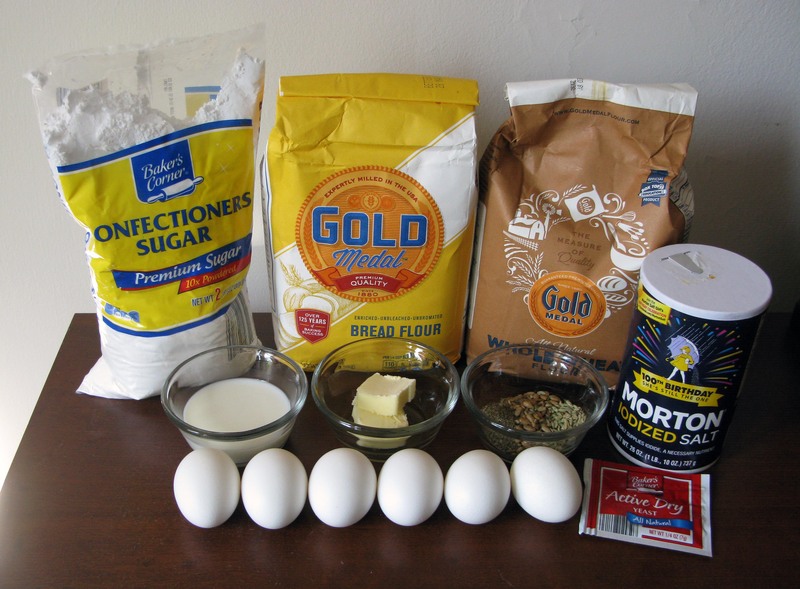 form, I am once again posting a holiday recipe after the holiday. Would you expect anything less from this perennial procrastinator? This bread was inspired by the Easter bread my mother used to make. 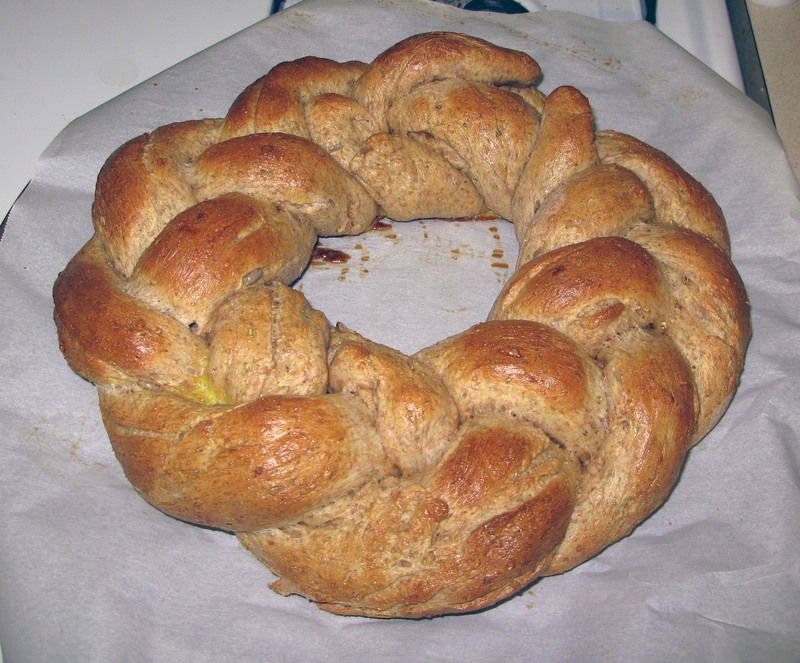 Hers is a plain, white, braided bread formed into a ring with dyed Easter eggs woven into it, so it wasn’t quite what most people probably think of as Easter bread. 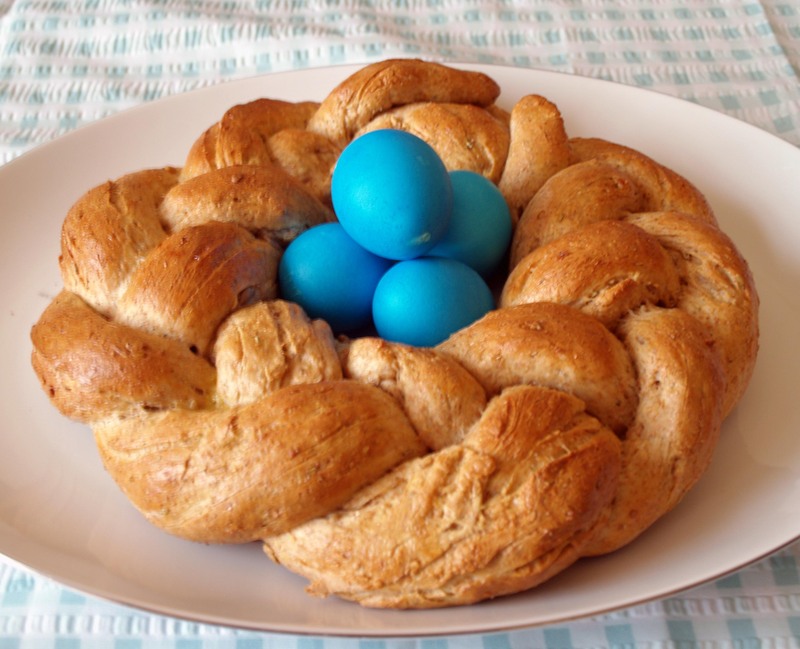 I decided to use the idea of the braided bread with Easter eggs as decoration, but turn it into a nest for the eggs instead. I chose to use blue eggs to make it look like a robin’s nest, but brown or white would also make good bird’s nests, and any assortment of colored eggs would be fun. 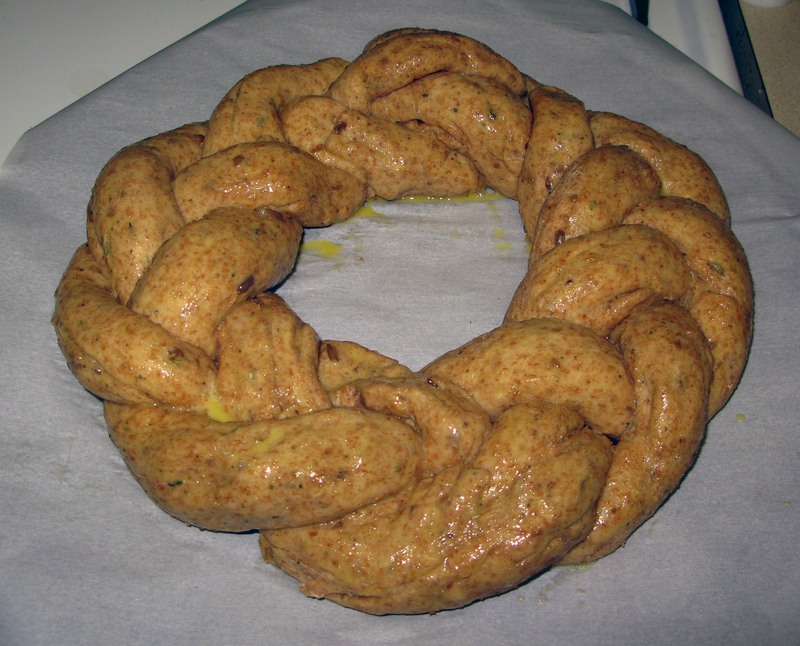 I used my Pesto Pinwheel Bread recipe as a starting point, which is adapted from this Great British Baking Show recipe. At this point, it’s barely like my pinwheel bread, and just about nothing like the GBBS version. I swapped half of the bread flour with whole wheat flour to make it look browner, and I adjusted the seasoning blend so that it turned out fragrant and slightly sweet. I also added sunflower seeds to give it some crunch. If you’re into grains like quinoa or millet, you could try using those instead (I can’t vouch for these options, so proceed at your own risk). If you do tinker with the mix-ins, please share your results! Something that you’re either willing to listen to all day, or something you prefer to listen to in short bursts. This bread takes very little active time, but a whole lot of overall time (a pretty standard situation for yeast bread). If you’re planning to do marathon music, I’ll always suggest Queen, because I can listen to them all day, any day. If you’re in the mood for only accompanying your active prep with music, I’d go with the Talking Heads this time. Stir together the water and powdered sugar in the bowl of a stand mixer or other large bowl until the sugar is completely dissolved. Sprinkle yeast on top and let stand until it looks foamy, about 5-10 minutes. While you’re waiting for your yeast to breathe, stir together flours in a medium bowl and then set the bowl aside. 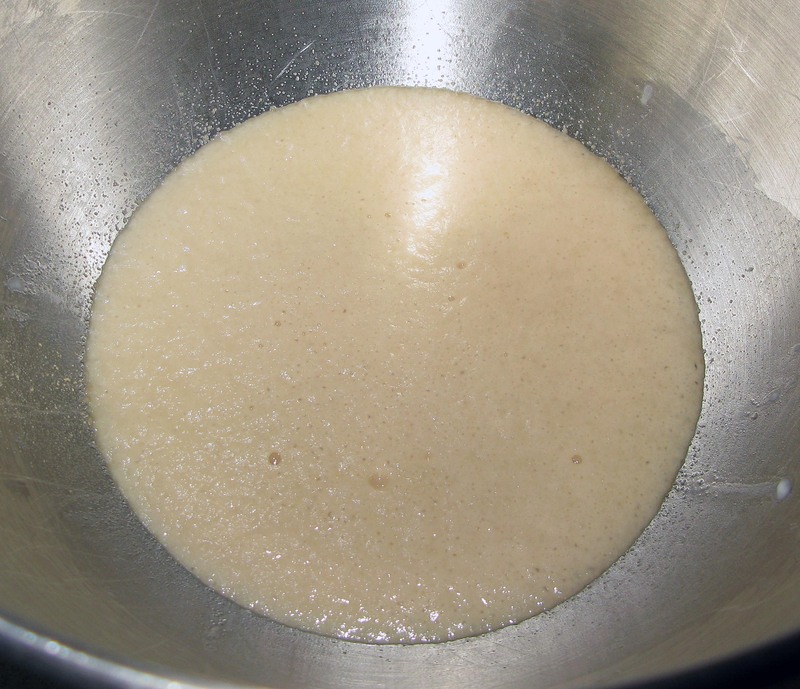 Stir the melted butter, warm milk, and eggs into the yeast water until combined. 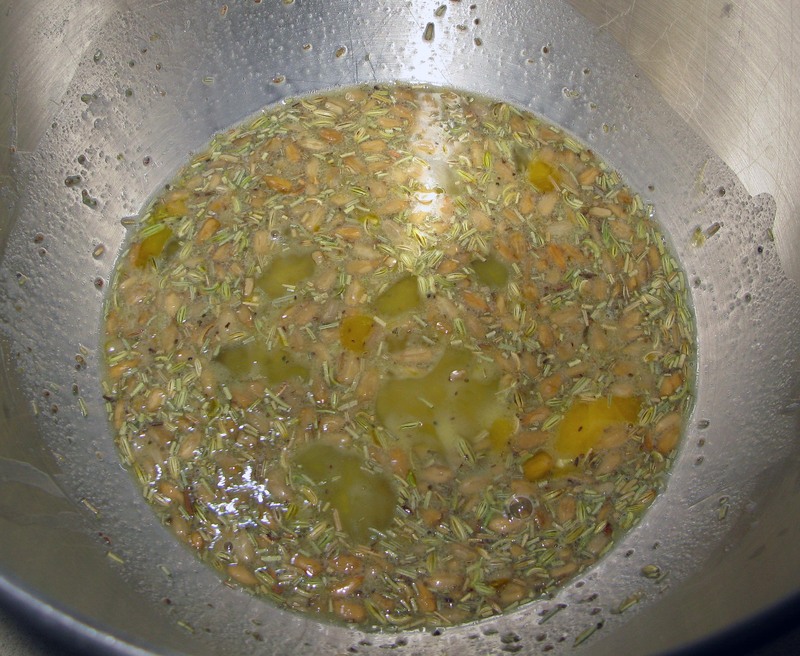 Stir in the salt, fennel, celery, sunflower seeds, and rosemary. 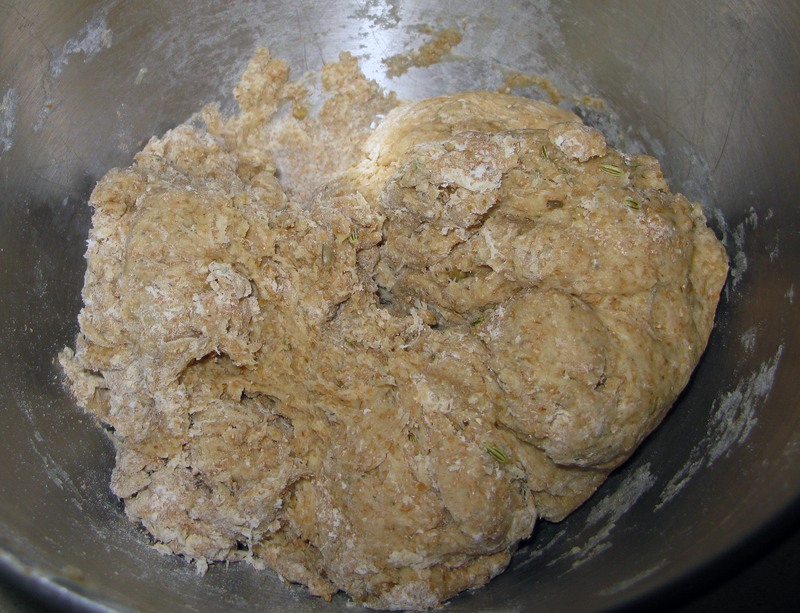 Stir in 1 cup of the mixed flours until the mixture is smooth. Add the remaining flour and stir until it is all fully-incorporated. Knead with dough hook for 5 minutes, or by hand on a lightly floured surface for 10 minutes, until the dough forms a soft, smooth ball. Put dough ball in a large, well-greased bowl and turn once to coat (I just grease the stand mixer bowl after the kneading is done to save on dishes I have to clean). Cover the bowl with a kitchen towel and leave the dough to rise in a warm place until it has approximately doubled in size, about 1 hour (my kitchen was a little cold, so it took me an hour and 45 minutes). 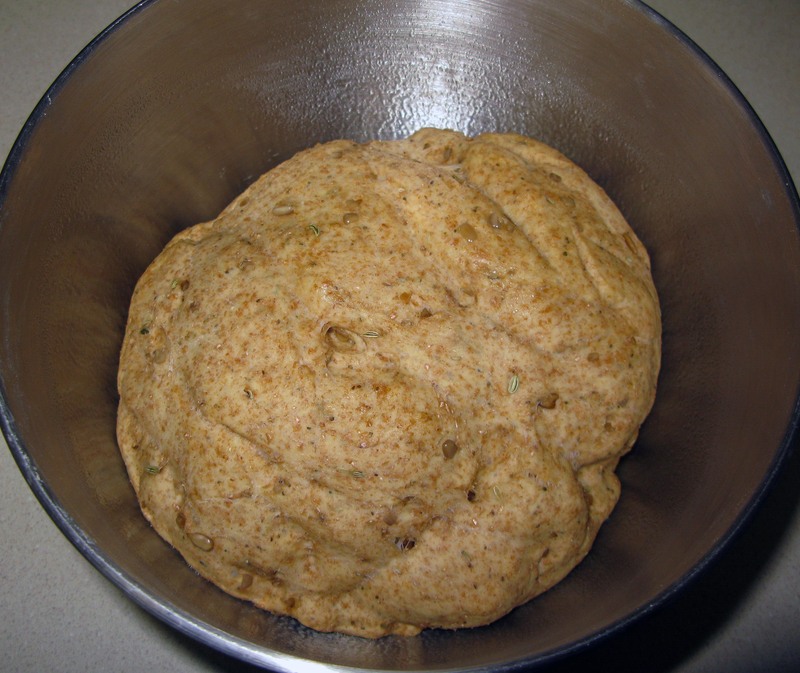 Punch the dough down and knead it a few times in the bowl. Form it into a log and divide dough into three even portions (you can use a kitchen scale to ensure accuracy, or you can just fly by the seat of your pants like I did). 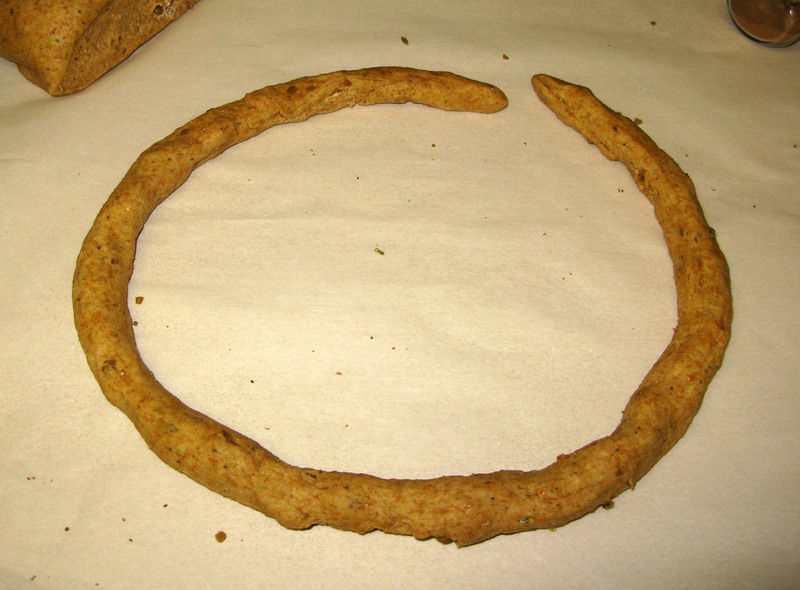 Stretch each portion of dough into an approximately 30” long rope. I found it was easiest to squeeze the dough into a log, then hold it by one end and use its own weight, squeezing it toward the counter, to stretch it evenly into a rope. If you don’t like this (somewhat inelegant) method, you could also roll each portion of dough into a 30″ long rectangle using a rolling pin and then roll the rectangles into ropes for a smoother rope. 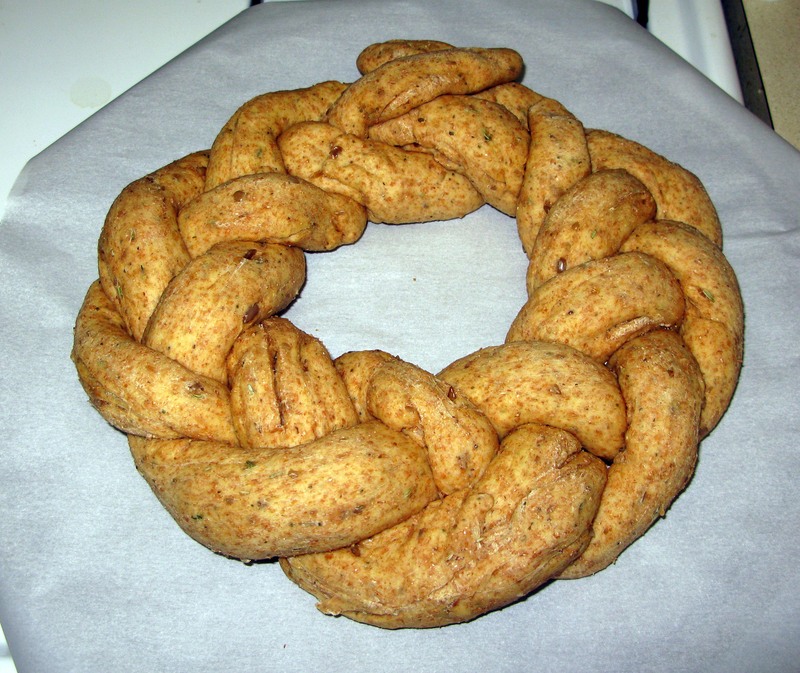 Braid the ropes together, then form the braid into a ring on a parchment-lined pizza pan or cookie sheet. It could be helpful to leave the first and last 3 inches unbraided so that you can braid them together at the end for a cleaner/more polished braided ring. Leave the dough ring to rise, covered with a towel, for 1 hour (it won’t quite double in size, but it will look significantly thicker). You can preheat the oven to 375°F now so that it helps the dough to rise. At this point, you can gently insert hard boiled eggs between ropes so that it looks more like a standard Easter bread. Otherwise, leave it as is and brush the dough with egg wash. Try to wipe up any egg that drips onto the parchment paper, as it will burn during baking. 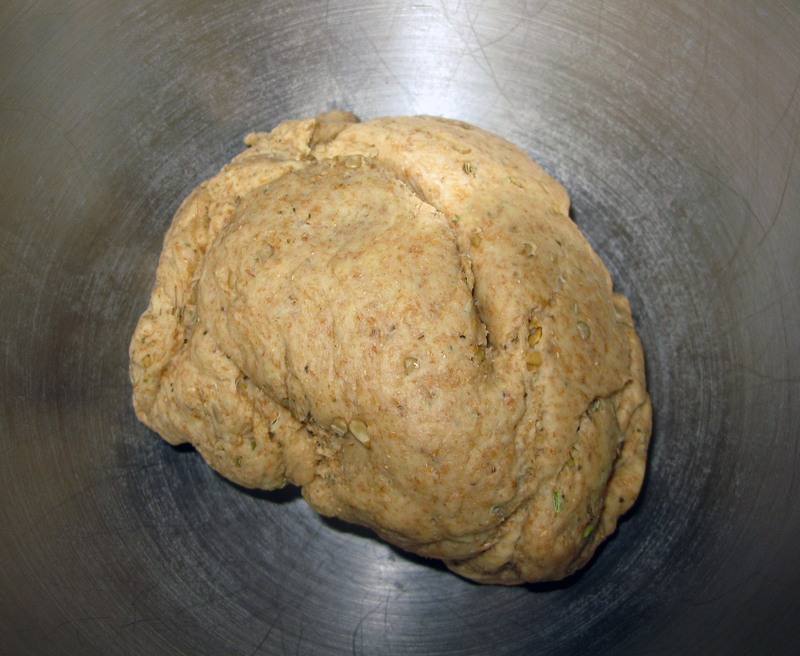 Bake the bread for 20-25 minutes, or until it reaches an internal temperature of 200°F. The top should be golden brown and it should be springy to the touch. Leave the bread to cool for about 15 minutes on the pan, then carefully transfer it to your serving platter of choice to cool the rest of the way. I know it’s tempting to garnish it with the hard boiled eggs now, but I suggest waiting until it’s fully cool if you don’t want the food coloring to transfer to the bread. When you are ready to show it off serve it, arrange the hard boiled eggs in the center so that it looks like they’re in the middle of a nest. If you baked the eggs into the bread, be sure to refrigerate the leftovers. Serve plain, or with a little bit of plum jam or salted butter. Enjoy!